Fishermen in Victoria, Australia, didn’t know what to think when they reeled in a prehistoric-looking creature from the water. They noticed its head and body looked like it belonged to an eel, but the tail looked like a shark’s. They unknowingly captured a very rare frilled shark, sometimes referred to as the “living fossil,” according to the Telegraph. The creature’s ancestry goes back roughly 80 million years and is rarely sighted. 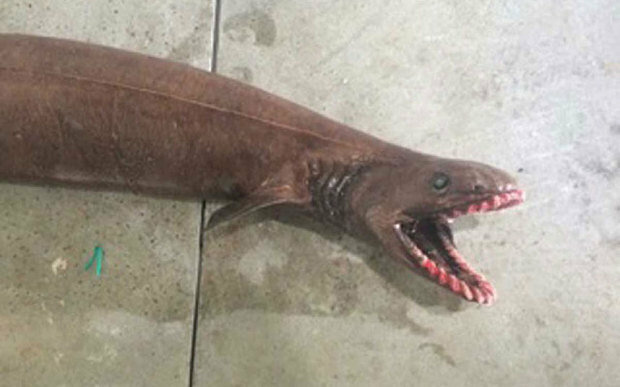 A staffer with the South East Trawl Fishing Association, Simon Boag, told the Telegraph that he’s never met a fisherman who had seen the frilled shark before. The creature was confirmed to be a frilled shark by the Commonwealth Scientific and Industrial Research Organisation (CSIRO), according to the report.